There are plenty of tourist spots in Cebu. But what stands out in Cebu is its islands. And one of the premiere islands for tourists is Camotes Island. From Cebu City, flag down a taxi and go to the North Bus Terminal. Travel time is around 15 - 20 minutes. Fare is around P100.00. Arriving at the terminal, you can ride a bus en route either to Hagnaya, Maya or Bogo City. All these buses will pass by Danao Port. Travel time from the terminal to Danao port is approximately 1 hour. Fare is P60.00 aircon. Then, alight at the port of Danao (it is situated along the highway). Buy a ticket en route to Consuelo Port. Travel time is 2 hours. Fare is P180.00 non aircon and P200.00 for aircon (aircon is first-come basis only). Then, you will board this Ro-Ro. There is only one shipping line plying the route - Jomalia Shipping. Travel time is 2 hours. Upon arriving at the port, hire a habal-habal ride to your resort/accommodation. The best choice is Santiago Bay. The view is simply spectacular! This is where I stayed and you will not regret it. But it has no cable television and wi-fi. From Consuelo port, travel time is 15-20 minutes (8 kilometers). 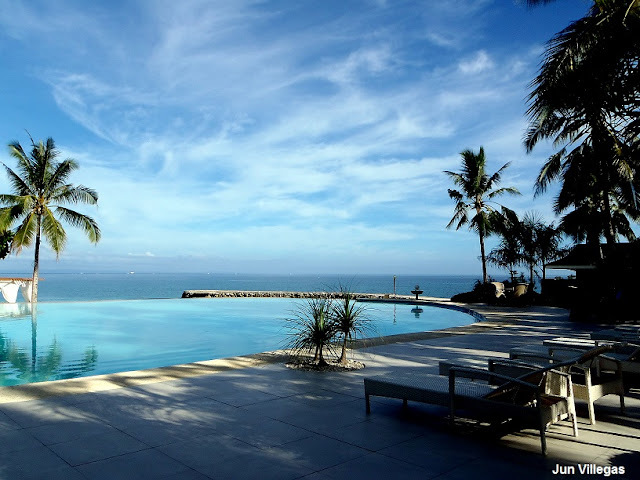 Second best choice is Mangodlong Paradise Beach Resort. You will love the infinity pool, wi-fi and cable television. Travel time from Consuelo Port is 10 minutes (5 kilometers). Third choice is Mangodlong Rock. It has a huge rock in the middle of the resort. Should you choose to stay in Camotes Island, you can go around the see the various tourist spots. They have Old church, falls, cave, Boho Rock formation and Lake Danao. Should you wish to tour the island, the cost of the habal-habal tour is P600.00 for 3-4 tourist spots. The tour is whole day. The farthest is the cave tour. But I paid P250.00 for the tour of Lake Danao and the 3 resorts that I mentioned. The tour was good only for 2 hours. My guide's name is "Zobel" - 0910-409-8550. He is very kind and accommodating. It's More Fun In Camotes Island! Love your pictures. Stay in focus and keep shooting! Thank you for including us in your website! If you need a better picture with the pool view, let me know! hi this is alfred. i have aircon vans and multicabs for island tour in camotes. my aircon van is the same rate with non-aircon vehicle. for more info: contact us: 0926-529-6337 ; 0910-879-5577 ; 0922-2291336. thank you. our rates is always negotiable. do you still have transportation services even until today? Hi Sir. which resort would you recommend the most? Santiago Bay Garden or Mangodlong Rock Resort? thank you in advance! Can you please drop me a message in my yahoomail regis.chyne@yahoomail.com. How much if we rent "habal-habal" for a day tour for 2pax?